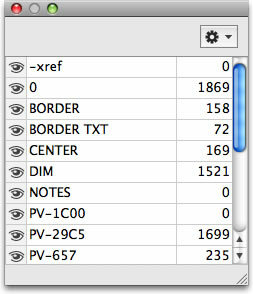 DWG Viewer for Your Mac. Microspot DWG Viewer is a product based on Microspot MacDraft Professional. With Microspot DWG Viewer, AutoCAD files produced on a PC can be opened and viewed on Apple Macintosh Computers. The Tool palette offers a full complement of tools. Users can easily navigate through their AutoCAD files via the zoom and hand tools, red mark-up can be added using the ellipse tool and annotation with yellow background can be inserted using the text tool. Our latest version of the DWG Viewer package includes better support for AutoCAD DWG/DXF files including support for the AutoCAD 2010/2011 DWG format. The user has the ability to open not just the model space but also any layouts that the file contains. Once your AutoCAD file has been opened in the DWG Viewer you will be able to see all the layers in the document via the layers window. These layers can the be hidden or grayed giving you full control over exactly what you want to see and what you don't. 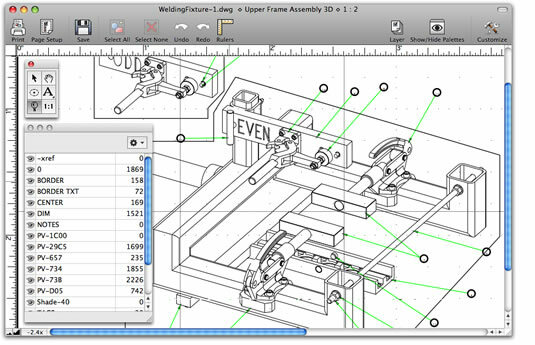 For detailed information regarding our DWG and DXF viewer for Mac, please have a look at DWG Viewer. For information about our CAD software, check out MacDraft Professional.